In light of China’s unfair retaliation, I have instructed the USTR to consider whether $100 billion of additional tariffs would be appropriate under section 301 and, if so, to identify the products upon which to impose such tariffs. I’ve borrowed a graph from Alec Phillips and Andrew Tilton, and added the $100 billion figure to place in perspective what this would mean. 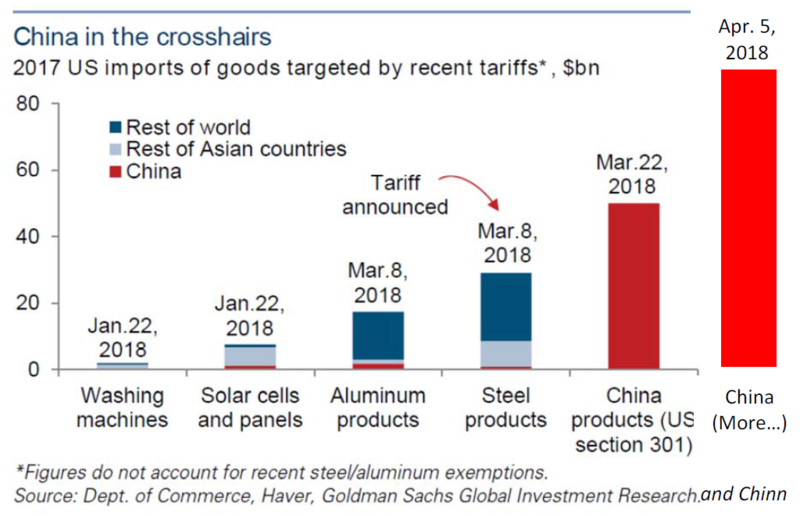 Source: Alec Phillips and Andrew Tilton, “Assessing US-China trade tensions,” Top of Mind: Trade War 2.0, Goldman Sachs, March 28, 2018. One has to wonder if this directive will add to the dustbin of other unfulfilled directives, but if it were to actually be implemented, this graph is useful to place in perspective the impact. 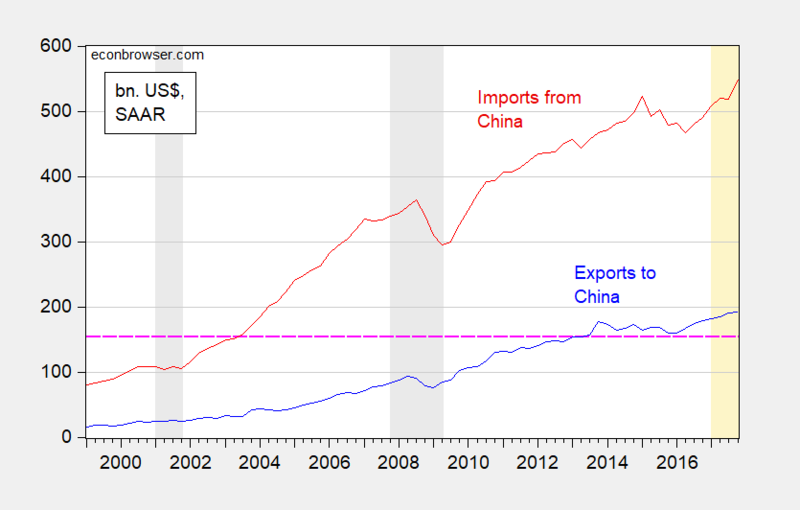 Figure 1: US exports of goods and services to China (blue), and US imports of goods and services from China (red), both bn $ SAAR. Pink dashed line at $153 billion, coverage of imports if all proposed sanctions imposed. NBER defined recession dates shaded gray. Orange shading denotes 2017 period. Source: BEA, and NBER. It would be hard for China to impose tariffs on comparable amounts of imports from the US. An additional $100 billion of US tariffs on Chinese goods would likely fall on more consumer-sensitive goods (communications equipment like smart phones). In other words, risks abound on both sides. The question is really which side is willing to endure more pain (including the pain of losing face). I was interviewed today by WPR, and asked whether the $50 billion Section 301 tariffs were merely a negotiating tactic. Mr. Trump’s latest utterances make me think more and more there is very little cunning strategic calculation behind his directives. This entry was posted on April 5, 2018 by Menzie Chinn. Now we might perhaps see the rationale for the removal of term limit for President of PRC . Xi now has better staying power then Trump even if Trump gets his second term. No. Xi has put the Communist Party in an all-or-nothing position. You cannot run a complex economy without the rule of law. Therefore, either Xi can mimic the rule of law, wrt to economic rights; or China will eventually withdraw from global engagements, as it has historically; or China will face a political crisis, most likely after US shales lose their resilience, put it somewhere in the first half of the 2020s. Come 2025, it will be all or nothing. steven, perhaps you could provide some evidence for your predictions? xi is in a rather strong position in china. and while you may not like him, or his approaches, china has continued to grow in a rather orderly fashion. you may not like the fact that he uses his government fist to keep that order, but nevertheless that is the way china is growing. there is some hysteria amongst the anti-communists that insist china must fail-because chinese success places their free market ideology into question. the world may not be as binary as some desire it to be. Yeah, I’ll probably write this up as an article. Also, my views should not be construed as dislike of Xi. It’s not personal, it’s structural. But, yes, I’ll write it up at some point. If you need something to tide you over, I will probably get dysentery at least once in the time it takes Kopits to write that. I can take a big smear of the dysentery on some tissue paper and send it to you FedEx. That smear will have the same prognosticatory value as Kopits’ write up. But keep in mind my dysentery smear is largely “structural”, and you will have to wait until 2025 to see if my smear is even near to accurate. Here you go, Moses. Here a forecast of ours which has held up. No 1 story on CNBC today. Here you go. And let’s hope Moses is feeling better. thanks for the writeup steven. while i may not agree with all of your positions, at least you have tried to defend them with some reason. but i have another scenario which you do not completely accept as a possible outcome-although it is highly likely. first i would like to ask you about the performance of china under xi. how would you characterize china’s performance under the past 5 years? overall, i would say china has probably outperformed most of the world on an economic basis. the people have prospered. this has occurred under an authoritarian type of system, for sure, but inside china there is an interesting open market and entrepeneurship activity which is hard to overlook. there really is no hint of rebellion-even with the authoritarian rule. you may not like his governing style, but china under xi’s rule has been rather effective for the people overall. if he continues to have an authoritarian rule, but also continues to make good decisions for the growth and future of the country, why do you think this path must lead to failure? in think you are right in one scenario-the city state option. it is very possible xi will continue to maintain political grip while providing even more economic freedoms. contrary to what some on this blog say, it is probably possible for an authoritarian government to actually make good long term decisions for a nation. today in the us, we have evidence that even in advanced democratic societies, poor decisions can be made as well. Donald Trump “Blunderbuss” approach!!! Donald Trump “Blunderbuss” approach!!!! “Blunderbuss”!!!! Menzie, just who in the hell do you think you are!?!?!?! You’ve now sullied, defamed, and SOYled (I say, sullied, defamed, and SOYled ) a really great Jack White album. How dare you!!!! Great interview on WPR Menzie. I don’t know how many interviews you turn down but you do a great job of choosing venues. When East Asian factories move from one East Asian economy to another, the US trade balance doesn’t grow as much as it might have. Factories move from Japan to China, for example, to lower costs, which reduces the price Americans pay. This has no effect whatsoever on US production jobs since the factory relocated from Osaka, not Ohio. In the 1990s, US imports from Japan, China, Korea, Hong Kong, Taiwan and Singapore comprised 32.5% of total US imports. In this decade, the share is 31.7%. The difference is that Japan’s share fell from 15.7% to 6% while that of China rose from 6.2% to 20%. I always appreciate additional sources of information which I have never seen or heard of. I find that these under the radar bits of news can be quite illuminating. Could you list of the unfilled directives that are in the dustbin? Trump claimed we have a $500 billion trade deficit with China. Your graph shows why this is not true. We imported $505 billion in goods from China in 2017 but we also exported $130 billion in goods to China. Ali Velshi on MSNBC proved he is even dumber than Trump as he kept saying our deficit with China is $375 billion talking about both goods and services. No Ali – your figure is the merchandise deficit. We have a services surplus with China that is almost $40 billion for 2017. Look – the press needs to call Trump out on his lies but could we get better reporters than the clueless Ali Velshi? 3. Much of China’s GDP is dependent on direct and indirect exports to the U.S. and ill-gotten U.S. intellectual property. China is not only wrong, it’s holding a weak poker hand. It should be settled through negotiations. Are the Sinclair Broadcasting economic reporter? Congratulation on replacing Faux News as the most dishonest fake news outlet ever. The pattern is called ‘narcissistic personality disorder’, a severe mental illness. This is Trump’s central problem and soon the problem of the world’s economy. Pompous and arrogant demeanor, Grandiosity, Fixated on fantasies of power and success, Self-perception of being unique and superior, Exploitative of others, Unwilling to empathize with the feelings, wishes, and needs of other people, Intensely envious of others, MASSIVE overreaction in case of criticism or rejection. Reasons for this and Trump’s illness are still in discussion, but most probable emotional neglect during babyhood, no love by his mum. Indeed, there are women who are not able or willing to give love to their child. Poor Trump. Excellent link to Top of Mind, if others missed it, it below. On the whole I would rate the analysis more positive for President Trump than negative. A notable highlight. From Jennifer Hillman, a former member of the World Trade Organization’s Appellate Body. And perhaps the most negative of the interviewees. In the interview, she is a strong advocate of the WTO. But she also was quite clear on the limitations of the WTO, particularly dealing with China. And by far the best quote from her. The implication is clear, but I would like to read others here about them. This is just a taste of the complete issue. Well worth the read. The same thing goes for US Steel. It has struggled for decades and is always calling for tariffs to bail them out. BTW of our $20 billion in steel imports in 2017 less than $350 million came from China. We import more steel from Sweden than we do from China. We do import a lot of steel from Canada, Mexico, Japan, Korea, and Germany. You might know this if you checked the data at http://www.census.gov. That’s what you get out of this. You are getting pathetic and a little strident. You are saying only the Chinese deviate from free markets but that is clearly not an accurate statement. I think it’s obvious that the best way to resolve this standoff is to see who has the bigger hands…President Xi or President Trump. Subsidizing US agricultural exports! That would put us in the same boat as the one Team Trump claims re China. They subsidize steel exports, we tax them. We subsidize soybeans, they tax them. And only the tax accountants and lawyers get rich. Yes, what the Chinese do best, when they aren’t lying, cheating, and stealing, is corruption, crony capitalism, misallocate resources, cause negative externalities, prevent creativity, create inefficiency, and export much of its GDP. Oh my – you just suggested Donald Trump was Chinese. Give this racist garbage a rest PeakyBoy. Pgl, you seem to be obsessed with race, most likely, because of the long history of racism in the Democrat party. You feel guilty and have to make up for it. And, China produces half of the world’s steel. It has been accused by other countries of dumping, which reduces the world price. There’s global excess capacity. I’m not obsessed with race but I do call out racist garbage like what you routinely inflict us with. China does produce a lot of steel but it also consumes a lot of steel. Anyone who produces something efficiently gets accused by inefficient firms of dumping. These accusations should be dismissed by anyone who get economics. But then you take these phony claims at face value. Go figure! PeakTrader: You forgot “being inscrutable” in your list. Report from my travels to Beijing, Shanghai, Xian, Guilin, Kunming, and Lijiang : My impressions was “being modest”, right in the tradition of Confucian values and Taoism. The direct opposite to Trump’s character. political hack with no proof of his accusations whatsoever-except that bantered about in the conservative echo chamber. you may not like the chinese, peak, but your commentary is simply racist and absurd. China’s export/GDP ratio is less than 20%. Canada’s export/GDP ratio is over 30%. Huh – are the Canadians “lying, cheating, and stealing, is corruption, crony capitalism, misallocate resources, cause negative externalities, prevent creativity, create inefficiency” etc? Pgl, you need to get over your paranoia about race and your support of totalitarian systems. To assume Canada is like China shows your extensive ignorance of economics. And, the Communists exploit the masses and the environment. “The government that magically managed to report 6-8% GDP growth in the midst of the financial crisis, when its exports were down over 25%, tonnage of goods shipped through its railroads was down by double digits, and its electricity consumption was falling like a rock. It is hard to manufacture 8% more widgets with a lot less electricity…China did not suddenly become energy efficient during the financial crisis. This is a government that will go to great length to maintain appearances to keep its ideology going. After all, it censors what its citizens may or may not read and imprisons the ones that write anti-government articles. China will do anything to grow its economy, as the alternatives will lead to political unrest…Since China lacks the social safety net of the developed world, unemployed people are not just inconvenienced by the loss of their jobs, they starve (this explains the high savings rate in China) and hungry people don’t complain, they riot. The Chinese government controls the banks, thus it can make them lend, and it can force state-owned enterprises (a third of the economy) to borrow and to spend. Also, since the rule of law and human and property rights are nascent in its economic and political system, China can spend infrastructure project money very fast – if a school is in the way of a road the government wants to build, it becomes a casualty for the greater good. Infrastructure and real estate projects are where you get your biggest bang for the buck if your goal is to maintain employment, since they require a lot of unskilled labor; and this is where in the past a lot of Chinese money was spent. This also explains why, in 2009, new floor space constructed was up 100% and residential real estate prices surged 25%. And this explains why they keep building skyscrapers even though the adjacent ones are still vacant. To make things worse, before the financial crisis and enormous stimulus ($586 billion), China was already suffering from what I call late-stage-growth obesity, inefficiencies that are a byproduct of high growth rates sustained for a long period of time. Though Chinese growth in the past was high, in its late stages the quality of growth has been low. For example, in an echo of past Chinese government asset-allocation decisions, China built the largest shopping mall in the world, the South China Mall, that is 99% vacant, years after construction. China also built a whole city, Ordos, in Inner Mongolia, on spec for million residents who never appeared. It’s been estimated one-third to one-half of China’s growth doesn’t take into account the social costs of health issues and environmental damage alone. Peak, 2010 is largely history way back in the context of China current 30 or 40 years of opening up and reform. “An investigation into the price of a Mattel Barbie doll, half of which is made in China, found that of the $10 retail price, $8 goes to transportation, marketing, retailing, wholesale and profit for Mattel. Of the remaining $2, $1 is shared by the management and transportation in Hong Kong, and 65 cents is shared by the raw materials from Taiwan, Japan, the US and Saudi Arabia. The remaining 35 cents is earned by producers in China for providing factory sites, labour and electricity. Benlu, you make it sound like ancient history. There has been some progress, but not much, and too often it’s temporary. For example, air pollution is still bad. The Communist government isn’t very effective. I think the one pattern I gather is probably the usual US standard operating procedure of using US superior might to have its ways. Lawrence Kudlow is flip flopping as he always does. He told reports: (a) we are not in a trade war as nothing has happened yet; and (b) there will be actions. This reminds me of 2002 and the first couple of months of 2003. We did not invade Iraq until March 2003 but we certainly announced the invasion well ahead of time. My understanding is that Larry Kudlow didn’t know about the latest $100B tariff POTUS brain fart until after it was announced. when you think about it, this trade war issue is really about who gains access to the chinese market. if china gets forced out of the us market, they will keep the chinese market all to itself. we seem to be living in the past, and disregard the chinese market as inferior. it is one of the largest in the world, and growing faster than the us market. we are at a disadvantage in the us, because in the future we need access to the growing chinese market more than the chinese need access to the us market. this is why us companies provide ip support in order to access the chinese market. i don’t think trump fully understands this issue. I saw Kudlow on TV yesterday and he looked like he was high on coke again. There is no latest 100 billion tariff. All that has happen was the call for section 301 investigation. Any tariff that comes from the investigation is many months down the line. Ed Hanson: Well, for that matter, there is no $50 billion Section 301 tariff, as there is a comment period, and up to six months before any approved tariffs go into effect. So there! I do not consider it picky, slug used that language intentionally for effect. Ed Hanson I used that language because it tracks closely with what Trump said: “”In light of China’s unfair retaliation, I have instructed the [United States Trade Representative] to consider whether $100 billion of additional tariffs would be appropriate.” In other words, the conditional here is “China’s unfair retaliation” to Trump’s $50B tariff. So unless Trump intends to back away from his $50B tariff, which is what precipitated “China’s unfair retaliation”, the conditional or predicate for the $100B in additional tariffs still holds. The markets clearly took Trump’s instruction as more than just one among many possible policy actions that the USTR might want to consider. You have to ask yourself, under what conditions would the USTR not consider the $100B “appropriate” as long as China maintained its “unfair retaliation”??? To make matters worse, Trump himself reinforced his threat of an additional $100B after some on his staff tried to downplay it in the same way that you are trying to downplay it. I didn’t down play it, you over played it. Nice stuff with your conditional, but the real meaning comes from the verb consider. As I explained to Menzie, that puts your language far from accurate, and as I said intentionally so, for effect. Ed Hanson If you ever worked in government, then you would know that an instruction “to consider” is a nice way of saying “do it.” Why? Because if you decide against the proposed action then you also have to demonstrate that the boss’ predicate is wrong. In other words, deciding against a $100B tariff means that you’re saying the boss is wrong about “China’s unfair retaliation.” And do you really think anyone in the Trump Administration is going to tell Trump that he’s wrong? Not with that ego. Try to imagine another plausible scenario. The 100b list is most likely already there. The Trump team wouldn’t be launching a trade war without any strategy, preparations for escalations. 1. Typically, a country’s data on exports and imports often are not consistent – for example, the U.S. data might show U.S. exports to Canada that are significantly smaller than Canada reports as imports from the United States. 2. Often, a manufactured product is composed of parts that are made and assembled in different countries, so that looking only at the final sale to retailers or wholesalers can materially mislead if the goal is to get the trade balance in value added. Do you have any idea how taking account of these factors would affect the trade balances shown in your graph? don: I addressed (2) in this recent post. Brad Setser discusses (1) the mismatch in US and Chinese statistics (which is well known, and has to do in part with timing, and and treatment of re-exports from HK). The volatility this has created in the market begs another question imo. Does market volatility itself portend a bear market? There was a time when the Lowry 90/90 days were a decent signal of a reversal in trend, and we’ve certainly seen some of them of late. I’m curious as to any thoughts on the subject. Also, volatility selling as a portfolio overlay got very popular the last few years, which may be aggravating these moves. Right now I can give you my best market indicator. It is sell because I am still 100% in. When I finally chicken out and sell I will tell you, if you care to hear. At that time the indicator will be a strong buy. Or so my history in the stock market so says. Ed, it means you are always behind the curve, need to get to a notch or two more. If it is only a notch or two more means I have finally started to catch up. In the mean time please feel free to use the Ed market indicator before those notches ruin it. Well Ed, I’m currently 100% invested too, so for now we are in the same boat. The volatility scares me, particularly given I know there are institutions that are short vol without understanding the consequences. For now, I’m hanging my hat on corporate profits and the tax cuts, which I think are much more substantial than tariffs. That said, stimulus at home, combined with inflationary tariffs could create enough inflation to get the FED to be more aggressive than is warranted. I also believe oil prices will trend higher given projected deficits in Q2-Q4 18. Econbrowser has demonstrated that an inverted yield curve is a predictor of recession, and the stock market tends to predict (trigger?) recession 6 months ahead of time. So, it’s a dicey situation we’re in. That said, there are oil companies trading at 4x 2019 earnings right now. So, I’m staying long. Good luck! This is classic PeakIgnorance. I did not say that. I did provide what the World Bank noted in terms of Canada’s export/GDP ratio being greater than 30% whereas this ratio for China being less than 20%. Peaky’s first reaction is to suggest the World Bank is lying and then he totally changes the subject by misrepresenting my simple point. But this intellectual garbage is Peaky’s day job so don’t let me get in his way. Pgl, you’re full of “ignorance,” “lying,” and “garbage.” More name calling won’t help. Peak, where were you during last 40 years of China opening up? Benlu, China produced a lot of good and a lot of bad. The U.S. created a lot of good over the past 40 years and reduced the bad substantially. For example, compare pollution today to the 1970s. And, of course, there’s been an explosion in growth of high tech firms. “People often compare China’s urbanization to Western industrialization in the 19th century. In both cases, a large population moved from the country to the city. Society advanced from agricultural to industrial via manufacturing on a massive scale. In the United States and Europe, the manufacturing industry was created due to technology innovation. For example, railways came into existence because of the invention of the steam engine, and automobiles were created because of technology breakthroughs in automobile engines. In China, the manufacturing industry is being created in response to global demand. Chinese manufacturers take orders from Western companies that have designed products for their home markets. They have no involvement with product development, innovation, market research, and even packaging. James Fallows (an economist) visited many factories in China. He saw people working on the assembly lines and was convinced those tasks would only be performed by machines in the United States. In 2008, U.S. manufacturing output was $1.8 trillion, compared to $1.4 trillion in China….the United States is producing goods with higher value, such as airplanes and medical equipment. PeakTrader James Fallows (an economist) visited many factories in China. I’ve corrected you many times on this same point. Please try and retain information. James Fallows is NOT, repeat NOT and economist. Got it? He has a bachelor’s degree in American history and literature. Make a note of it. Now go and sin no more. That is why Chinacomsidered itselfa developing country but Trump thinks this is not fair. Could please help convince the Trump team? Thanks mp I need all I can get. So I will repeat your response, “I did not say that.” But am willing to be reminded if I did, So put up or shut up.